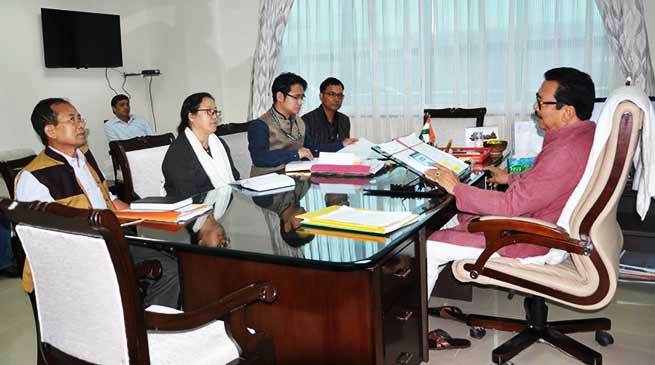 The Dy CM of Arunachal Pradesh Chowna Mein asked the Departments of Planning & Investment and Industry to expedite the process of ‘Ease of Doing Business’ which was passed in the State Cabinet in the month of January 2017 with a view to provide a Single Window System to the investors or the companies willing to open new small or medium size industry in the State. “Single Window System would facilitate in getting forest clearance and obtaining other formalities on time bound manner without hassles”, he said and added that it should be made functional as early as possible. Mein opined that many investors and companies are willing to invest and set up new factory/industry in the State but because of time taking procedures to obtain forest clearance and other formalities for which they have to run from door to door from one department to another, they are reluctant to invest and set up industry in the State. ‘Ease of Doing Business’ will facilitate the investors and companies in obtaining forest clearance and other formalities in time bound manner from a single window. Once it is functionalized, it will open a new gate for the prospective and existing business community in the State. If industries come up within the State, it would also provide employment opportunities to the educated youths and will drives forward the State’s vision of prosperity for all – by employing technology, innovation, inclusivity and sustainability which are key factors for development, he said. Side by side, Mein also discussed the draft new Industrial Policy of the State and asked the department to align it with the New North East Industrial and Investment Policy before putting it up for vetting and approval by the State Cabinet. He discussed these issues in a meeting with the Secretary (Finance), Y W Ringu, Secretary (Planning & Investment), Dr Joram Beda, Director Industry, Taru Talo and Director Planning (Monitoring & Evaluation), Mokir Eshi Ori in his Civil Secretariat Office here today.